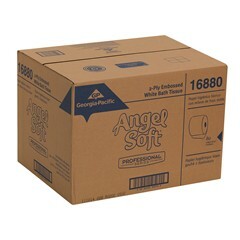 Angel Soft® Professional Series™ is the brand of premium two-ply bathroom tissue that delivers the appearance and softness of at-home tissue for today’s discerning business customers and employees. Whether you manage a hospitality property, restaurant or an upscale office building, you want to make a positive impression on your guests, patrons or tenants – every time. One of the most simple and fool proof ways to impress people at minimal cost is to offer your customers quality, familiar brands to use in your facilities. High capacity 450-sheet count roll decreases roll changes which reduces labor costs. Coordinates with facial tissue boxes for an elegant, professional look.